Uillinn West Cork Arts Centre, Community programme presents creative engagement opportunities for communities that increase arts participation and make accessible, critical cultural experiences for our rural community. West Cork Arts Centre works with many local partner agencies across the county to reach the wide geographical span and diversity of our community. Our reach includes the Skibbereen and Bantry urban and rural area which stretches from the Beara Peninsula in the west, to Clonakilty in the east, from Dunmanway in the north, to the islands of Cape Clear and Sherkin in the south. We aim to be both inclusive and accessible working with our partners on ensuring inclusivity is integral to our programming. Join Skibbereen Community Choir, an inclusive weekly social musical choral experience. Inclusive Dance, an opportunity to join this weekly facilitated workshop for all abilities to explore and enjoy dance. 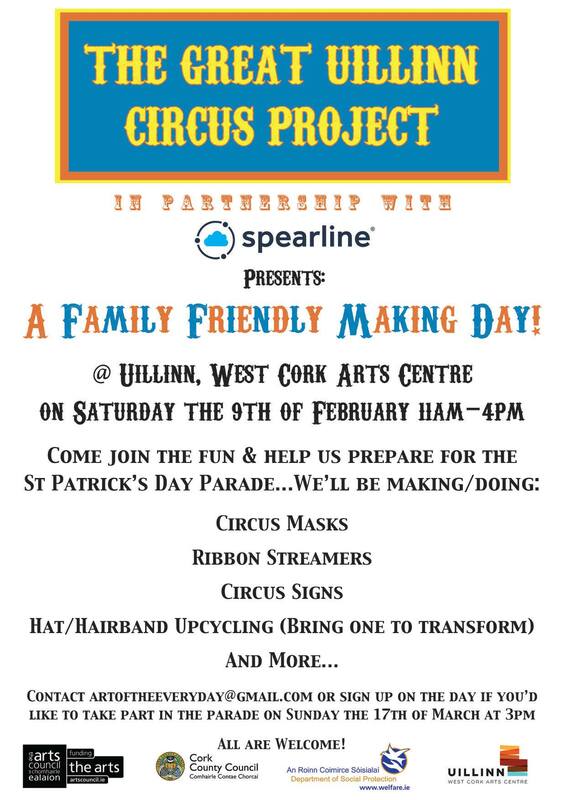 The artists will create a visually spectacular and eco-friendly response to the theme ‘Circus’ for the St Patricks Day Parade 2019 by creating upcycled costumes to be made and worn by 10-15 performers of a range of ages from the local community. All materials will be pre-used and recycled wherever possible. Participants in the project will learn about the history of the circus and use their imaginations to think about what its future might look like. They will also develop characters of their own to perform as in the parade. Ana Ospina is a socially engaged artist and creative producer with a background in Theatre Design (specialising in Costume). Alice Halliday is an ethical fashion designer, specialising in unique made-to-measure Bohemian Bridal Couture & Event Wear. She has a passion for sustainability and uses mostly vintage and upcycled materials in her creations. Abigail O’Shea – Project Assistant is a student at Cork County College of Commerce, Art and Craft QQI level 5.